Applies a single scalar NeighborhoodOperator to an itk::Vector image region. This filter calculates successive inner products between a single NeighborhoodOperator and a NeighborhoodIterator, which is swept across every pixel in an image region. For operators that are symmetric across their axes, the result is a fast convolution with the image region. Apply the mirror()'d operator for non-symmetric NeighborhoodOperators. This filter assumes that the input and output images have pixels which are itk::Vectors of the same vector dimension. The input NeighbourhoodOperator must have a scalar type that matches the ValueType of vector pixels. To apply a scalar NeighborhoodOperator to a scalar image use NeighborhoodOperatorImageFilter instead. Definition at line 58 of file itkVectorNeighborhoodOperatorImageFilter.h. Definition at line 68 of file itkVectorNeighborhoodOperatorImageFilter.h. Definition at line 94 of file itkVectorNeighborhoodOperatorImageFilter.h. Definition at line 78 of file itkVectorNeighborhoodOperatorImageFilter.h. Definition at line 90 of file itkVectorNeighborhoodOperatorImageFilter.h. Definition at line 83 of file itkVectorNeighborhoodOperatorImageFilter.h. Definition at line 82 of file itkVectorNeighborhoodOperatorImageFilter.h. Definition at line 79 of file itkVectorNeighborhoodOperatorImageFilter.h. Definition at line 97 of file itkVectorNeighborhoodOperatorImageFilter.h. Definition at line 91 of file itkVectorNeighborhoodOperatorImageFilter.h. Definition at line 81 of file itkVectorNeighborhoodOperatorImageFilter.h. Definition at line 80 of file itkVectorNeighborhoodOperatorImageFilter.h. Definition at line 67 of file itkVectorNeighborhoodOperatorImageFilter.h. Definition at line 84 of file itkVectorNeighborhoodOperatorImageFilter.h. 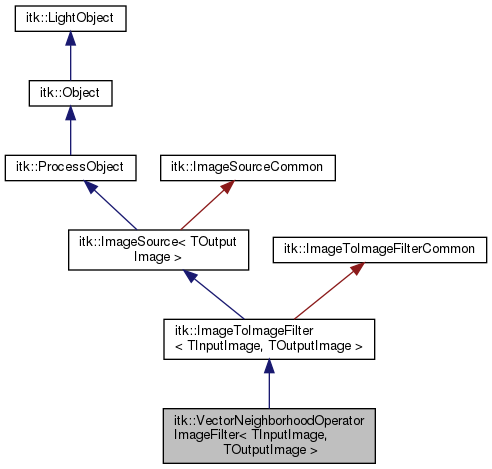 Definition at line 65 of file itkVectorNeighborhoodOperatorImageFilter.h. Definition at line 66 of file itkVectorNeighborhoodOperatorImageFilter.h. Definition at line 137 of file itkVectorNeighborhoodOperatorImageFilter.h. VectorNeighborhoodOperatorImageFilter can be implemented as a multithreaded filter. Therefore, this implementation provides a DynamicThreadedGenerateData() routine which is called for each processing thread. The output image data is allocated automatically by the superclass prior to calling DynamicThreadedGenerateData(). DynamicThreadedGenerateData can only write to the portion of the output image specified by the parameter "outputRegionForThread"
VectorNeighborhoodOperatorImageFilter needs a larger input requested region than the output requested region. As such, VectorNeighborhoodOperatorImageFilter needs to provide an implementation for GenerateInputRequestedRegion() in order to inform the pipeline execution model. Definition at line 115 of file itkVectorNeighborhoodOperatorImageFilter.h. Definition at line 158 of file itkVectorNeighborhoodOperatorImageFilter.h. Sets the operator that is used to filter the image. Note that the operator is stored as an internal COPY (it is not part of the pipeline). Definition at line 102 of file itkVectorNeighborhoodOperatorImageFilter.h. Definition at line 87 of file itkVectorNeighborhoodOperatorImageFilter.h. Definition at line 167 of file itkVectorNeighborhoodOperatorImageFilter.h. Pointer to the internal operator used to filter the image. Definition at line 163 of file itkVectorNeighborhoodOperatorImageFilter.h.